Full Tilt is one of online poker’s giants in the industry, and has had a massive amount of success for being such a new room. They launched in 2004, and since then they have been growing at a huge rate. The company was created by some of the biggest names in the poker world who wanted an online poker room to offer everything player’s could want or need within one company. They offer the largest available stakes online, professional poker players who can be seen regularly playing tournaments and ring games with players not to mention a huge sign up bonus. All new players can expect to receive a 100% match up to $600 sign up bonus. Players will find this bonus about average in terms of clearance rate. If you are a micro limit player you may find it will take you slightly longer because of the rake but in general it’s not bad. The bonus will be added to your poker room account in payments of $10 once you have received the required points. Comp points can also be used at the Full Tilt online store to buy entries into online tournaments, poker books and even Full Tilt gear. Readers of this site can download the Software from this page and receive the maximum bonus at this card room. Competition at Full Tilt is tough; there is no question about it. They have had this reputation for years now. What I do think in regards to Full Tilt’s level of skill within the room is that it is a great place for beginners to learn. You will be up with a varying level of players and you can really learn how to play poker by playing against others who push you to the max. For a more experienced player this room presents you with the opportunity to again push your game to the next level but gives a competitive edge like no other. The ring game selection is great. They have truly taken all players into consideration by offering your standard line up like Texas Hold’em, Omaha Hi, Omaha Hi-Lo, Seven-Card Stud Hi, Seven-Card Stud Hi-Lo and Razz, and continued with this into a mixed selection of games which also includes; H.A. (Hold’em and Omaha Hi), H.O.R.S.E. (Hold’em, Omaha Hi-Lo, Razz, Seven-Card Stud and Seven-Card Stud Hi-Lo) and H.O.S.E. (Hold’em, Omaha Hi-Lo, Seven-Card Stud and Seven-Card Stud Hi-Lo). Each of the above mentioned games is always busy so finding a table within your bankroll is not an issue. Full Tilt Limits: Games start at 5/10 cent blinds and cap out at $500/$1000 NL Hold’em tables and $2000/$4000 Omaha H/L limit. Full Tilt has added micro stakes poker. With new lower limits for ring games, players can sit down at a $0.01/$0.02 No-Limit Hold’em tables for as little as $0.40, join a Sit & Go for as little as $1 or buy in to a Multi-Table Tournament for just 10 cents. One of the main areas that have set Full Tilt on a different pedestal is the range in stakes. They support games as low as the ultra micro stakes and reaches as high as $1000/$2000 NL. These games are amazing to watch and you should be able to find at least one or two professional players at these tables. Another important feature this room has taken into consideration is the tournament line up. All games will start within minutes of each other and are scheduled around the clock. I have never logged on and not been able to find a game starting within a few minutes which is important. Games start as low as $1 and can reach as high as a couple thousand for the big events. Full Tilt provides guaranteed tournaments on a daily schedule with the largest daily game guaranteed at $50,000. One thing that should be noted is any tournament that you play will have a larger playing field than any other room. On most cases you can expect the player registration to go well above 1,000 players. Prize pools are huge but and as such competition is at an all time high. $750K Guaranteed Every Sunday - Exactly as advertised. One of the largest guaranteed tournaments online. FTOPS – With over $15 Million guaranteed through 25 events, this is one of the best poker tournaments online. Iron Man Challenge – Play poker consistently to earn great prizes and entry into exclusive freerolls. To achieve Bronze status, you must earn 50 FTP’s for 20 straight days or 100 FTP’s for 15 straight days. To be the ultimate Iron Man and earn entry in to the 30K freeroll, you must earn 200 Points for 25 days straight. The Doubles – Play in two tournaments at the same time to win jackpot prizes for double cashes, double final tables, or double wins. Bust-out Bounties – Bust a Full Tilt pro in any tournament with more than players and win your buy-in back up to $200. Qualifiers and satellites are schedule for large events to the EPT, Aussie Millions, WSOP as well as any of the guaranteed tournaments that the room offers. These games can be played in a full MTT or you can opt for some step qualifiers found in the SNG lobby. SNG tournaments are just as popular as the rest of the room and available in many different formats. When selecting a SNG make sure you understand Full Tilt’s description of these games as some are for the tournament leaderboard while others only payout seats to qualifiers. 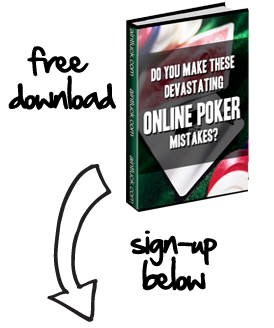 The software is easy to download and is designed for stability and security while offering a top class poker room. The lobby is very easy to read and navigate and one thing I do like is how easy it is to customize. An in lobby filter is available to modify which games you would like to see displayed along with the buy-ins you want them to be associated with. This filter is one of the more extensive in details I have seen anywhere else, and really makes things very simple and quick. Statistical data is available in the lobby such as pre-flop percentage and average pot size. You really do need to pay attention to these numbers at Full Tilt because there is so much competition found within the room. The graphics are clear- however I am not a big fan of the avatars used at this room. Some players enjoy the cartoon characters, I am just not one of them. I do like the instant replay in hands and find this to be one of the better features the room offers. While playing a ring or tournament you will see in the left hand corner of the screen a replay button and when clicking this, a popup will display with a video of the hand just played. 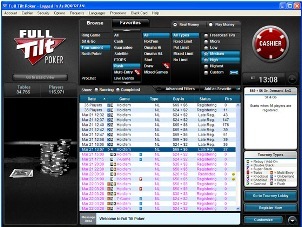 Multi tabling is available up to eight tables at once. This feature is very easy to use with players being able to multi-table without difficulties. Other than that the room does not provide any mind blowing features just those that player’s expect to be supported in a poker room. Full Tilt is Mac compatible, but players using an older PC may find the file size to be overly large and can slow down your PC. Support is available by email only and player’s can expect a delay in response time that can be slightly longer than most other rooms. This is one of Full Tilt’s weakest areas and really does need to be picked up. At this time we have not been able to contact Full Tilt by phone. We have asked a number of times for via email for their support phone number but have not been given one to call. We have recommended to Full Tilt that they supply a phone number for players. We will keep you posted on any updates. Players requesting a withdraw will have a 24-48 hour processing delay.